Asian-American superheroines Evie Tanaka and Aveda Jupiter protect San Francisco from perilous threats in the second book in Sarah Kuhn's snarky and smart fantasy trilogy - "The superheroine we've been waiting for." --Seanan McGuire Once upon a time, Aveda Jupiter (aka Annie Chang) was demon-infested San Francisco's most beloved superheroine, a beacon of hope and strength and really awesome outfits. But all that changed the day she agreed to share the spotlight with her best friend and former assistant Evie Tanaka--who's now a badass, fire-wielding superheroine in her own right. They were supposed to be a dynamic duo, but more and more, Aveda finds herself shoved into the sidekick role. Where, it must be said, she is not at all comfortable. It doesn't help that Aveda's finally being forced to deal with fallout from her diva behavior--and the fact that she's been a less than stellar friend to Evie. Or that Scott Cameron--the man Aveda's loved for nearly a decade--is suddenly giving her the cold shoulder after what seemed to be some promising steps toward friendship. Or that the city has been demon-free for three months in the wake of Evie and Aveda's apocalypse-preventing battle against the evil forces of the Otherworld, leaving Aveda without the one thing she craves most in life: a mission. All of this is causing Aveda's burning sense of heroic purpose--the thing that's guided her all these years--to falter. In short, Aveda Jupiter is having an identity crisis. When Evie gets engaged and drafts Aveda as her maid-of-honor, Aveda finally sees a chance to reclaim her sense of self and sets out on a single-minded mission to make sure Evie has the most epic wedding ever. But when a mysterious, unseen supernatural evil rises up and starts attacking brides-to-be, Aveda must summon both her superheroine and best friend mojo to take down the enemy and make sure Evie's wedding goes off without a hitch--or see both her city and her most important friendship destroyed forever. 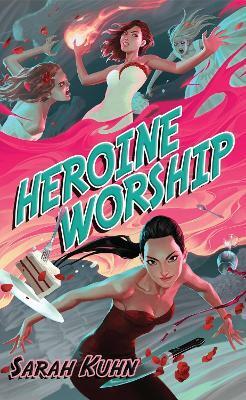 Sarah Kuhn is the author of the Heroine Complex series--starring Asian American superheroines--for DAW Books. She also wrote The Ruby Equation for the comics anthology Fresh Romance and the romantic comedy novella One Con Glory, which earned praise from io9 and USA Today and is in development as a feature film. Her articles and essays on such topics as geek girl culture, comic book continuity, and Sailor Moon cosplay have appeared in Uncanny Magazine, Apex Magazine, AngryAsianMan.com, IGN.com, Back Stage, The Hollywood Reporter, StarTrek.com, Creative Screenwriting, and the Hugo-nominated anthology Chicks Dig Comics. In 2011, she was selected as a finalist for the CAPE (Coalition of Asian Pacifics in Entertainment) New Writers Award. You can visit her at heroinecomplex.com or on Twitter: @sarahkuhn.